The world’s leading provider of mobile devices, Nokia has announced the availability of its new eye-catching Nokia 5230, the touch phone which combines an innovative design, cutting-edge technology as well as a world of entertainment in a single device, based on Symbian S60 5th Edition OS. “Competitively priced at 149 EUR, we believe the Nokia 5230 is an unbeatable offer for many new customers who aspire a device that stars in music, mingles with social networks from Facebook to MySpace, navigates you to where it happens, when it happens, and comes in an array of dazzling colors,” said Jo Harlow, Vice President of Nokia. 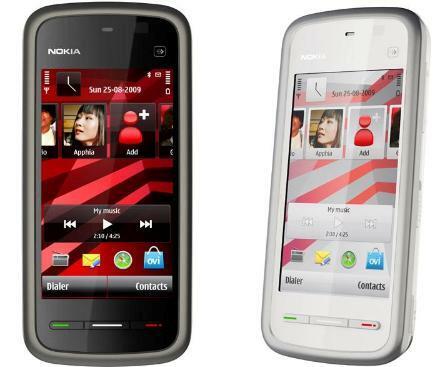 The new stylish and affordable Nokia 5230 which measures 111 x 51.7 x 14.5/15.5 mm and weights in at 113 g (without stylus) is expected to be available in the fourth quarter of 2009 for approximately 150 EUR and 260 EUR (include Comes With Music service), respectively.